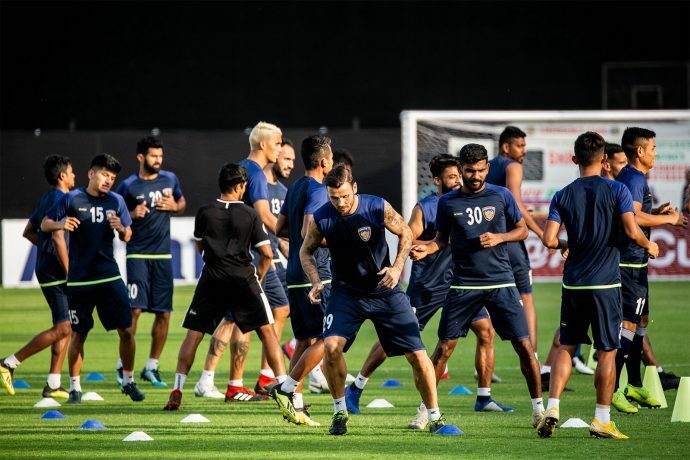 Two-time Indian Super League champions Chennaiyin FC are set to begin their maiden AFC Cup group stage journey with an encounter against Indian counterparts Minerva Punjab on Wednesday April 3, 2019 with kick-off at 7:30 PM IST. Chennaiyin became the first ISL outfit to enter the AFC Cup group stage after overcoming Sri Lanka’s Colombo FC in the South Zone qualifying playoff by a 1-0 aggregate scoreline last month. Jeje Lalpekhlua scored the winner for CFC in the 2nd leg in Ahmedabad after the first leg had finished goalless. The Mizo striker, who is the senior-most player in the CFC squad, has two goals in his last two appearances, having also netted in the club’s 2-0 Super Cup round-of-16 win over Mumbai City FC last week in Bhubaneswar. CFC are also boosted by the much-anticipated return of defensive midfielder Dhanpal Ganesh from a long-term knee injury along with Jerry Lalrinzuala who was also out of action. Ganesh got some valuable game time in the win over Mumbai City, having come off the bench in the second half. Ganesh and Jerry are integral additions to CFC’s defensive setup, that has kept three clean sheets in their last three games in all competitions. The CFC backline will be motivated to add to that tally when they take on Minerva. CFC’s young full-backs Laldinliana Renthlei and Tondonba Singh have also put in confident performances, with the latter having assisted two goals in the last two games which included Jeje’s winner against Colombo FC. “The team morale and confidence are high. We are truly honoured and raring to go for the AFC Cup group stage. It is important to get off to a good start against Minerva, who we will not underestimate. Our boys have been great defensively with the attack too getting back among the goals, with Jeje (Lalpekhlua) and CK (Vineeth) combining well. And to have Dhanpal (Ganesh) and Jerry (Lalrinzuala) back has only improved the atmosphere in the camp,” said the CFC gaffer at the official pre-match press conference. Chennaiyin winger Thoi Singh, who is the club’s top-scorer this season with four goals to his name was also in attendance. “We have been training hard and improved a lot in the last few weeks. As a group, we have focused on attacking and defending as a team and that has really helped us,” Thoi added. The Manipuri speedster is one of the nine players in the CFC squad who have played in the AFC Cup in the past; having turned out for Bengaluru FC earlier. Along with Chennaiyin, this is Minerva’s maiden group stage campaign in the AFC Cup. Minerva come into the group stage after defeat to Iran’s Saipa FC in the 2019 AFC Champions League preliminary round in February. The 2017-18 I-League champions have recently made loan signings of midfielder Samuel Lalmuanpuia from Shillong Lajong FC and Nigerian defender Kareem Nurain from Aizawl FC. The Punjab club have also brought in Trinidad & Tobago defender Robert Primus ahead of the AFC Cup group stage campaign. Interestingly, CFC midfielders Anirudh Thapa and Germanpreet Singh may feature against their former club, having played for Minerva Punjab in 2016-17 I-League season. The group’s other game on the opening matchday between Nepal’s Manang Marshyangdi Club and Bangladesh’s Abahani Limited Dhaka will be played in the former’s home ground earlier on the same day with kick-off at 2:45 PM IST.